Wishing all our members a very merry Christmas and a wonderful New Year! Now that she's walking it's a bit of a job to stop her toddling under their legs all the time(!) 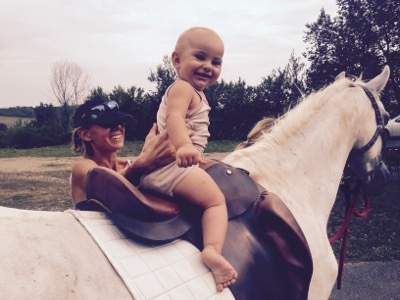 but the horses are so gentle and careful with her. Below: first sit on Octavia! 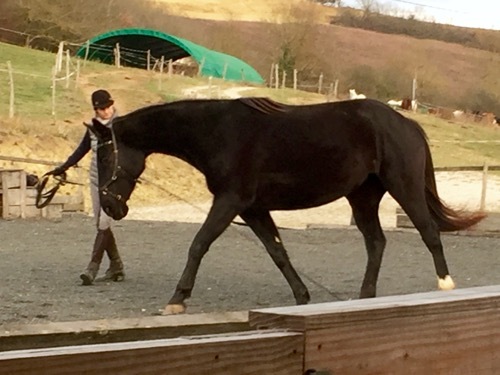 Licia's future steed Flicka (above) settled in in no time since she arrived at HHT last summer. 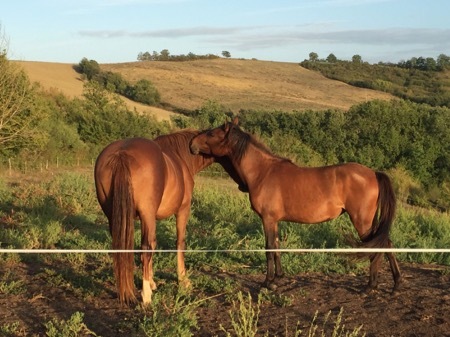 Jasmine, my mum's horse, took her under her wing as if she were her own baby. Flicka is only 2 years old, so since then she's just been coming into the yard for a bite of luzerne and a groom, and to learn to have her feet picked up. She is officially part of Uno's herd now - he formed his own little band of mares since the Camille's part of the herd left last year. The good side of his separation from his full sister Totti, who he was very attached to, is that he's matured to the point of taking on a leader role. Uno grooming with Vestale, one of his most loyal band-members! It's lovely that in the herd there is space for smaller bands to form in this way. 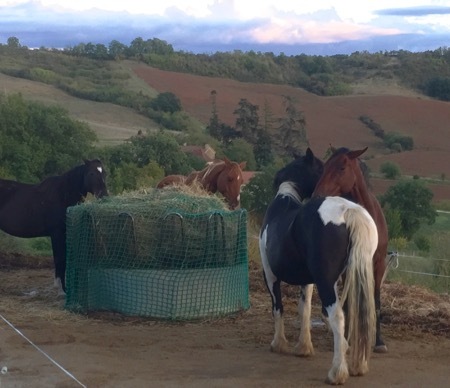 They go about their lives as they choose, and every horse finds their place. Some gravitate between groups, and others are very loyal to their chosen leaders. I welcomed a very nice selection of visitors for teaching this summer, a mixture of lovely new encounters and good friends who come back to HHT regularly and are making super progress. 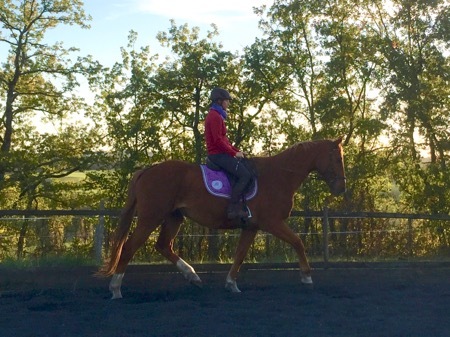 It was great to be moving on to more advanced straightening work with quite a few of the riders. I'll go into more detail on that subject in another newsletter. 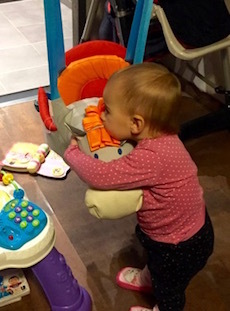 I wasn't sure how having people for residential teaching courses would work out this year with Licia, as I follow the Continuum Concept method with her (or 'attachment parenting') so she was not used to being apart from me. 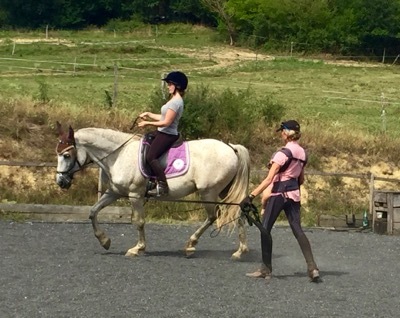 But thanks to my Mum's amazing help it all went fine, and if Licia really needed me then I just carried her and taught at the same time (all good for the core muscles!). 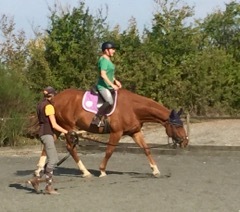 Teaching Jacqui with baby on board! 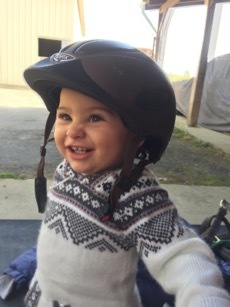 Apart from teaching, I've been really enjoying riding again this year after my maternity break! 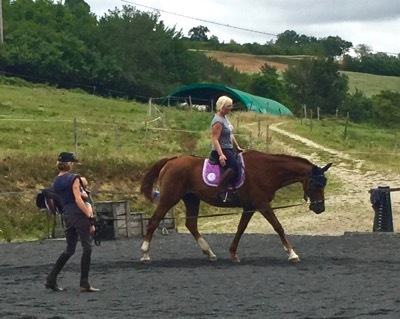 Training the three schooling liveries - Lulu, Vestale and Habanero - has been so rewarding as they all made very good progress. 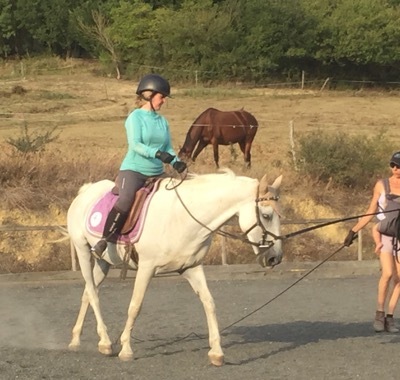 Lulu has become posturally strong and connected, Vestale more supple and balanced, and Habanero has transformed into a calm, rideable horse. I am sorely missing having anyone on hand to take photos, so I've not much to show of this work unfortunately! 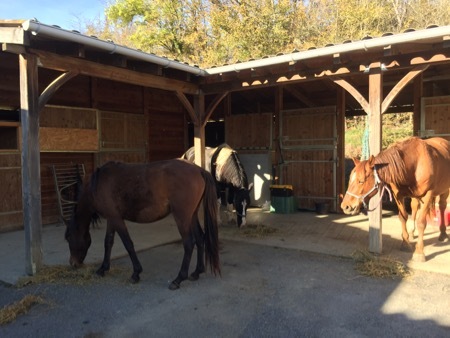 Both livery owners, Mélanie and Jo, came to visit several times and it was great to see them progressing along with their horses. 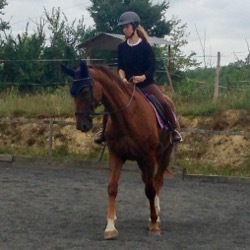 Since having a bit more time in the autumn, I've got Djinnie, my Hanoverian youngster, back into regular work. She's been quite a handful at times, and it's been a great learning process to bring her towards more relaxation and acceptance in her training. 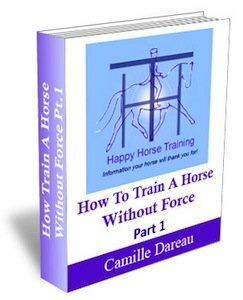 Tension in horses: To Listen or To Lead? Anyone interested in the subtleties of how we relate to horses in training is welcome to have a look at that! It's been immensely rewarding and fun working with my coaching clients this year since I launched this new way of teaching at a distance. I've been really pleased with how much I've been able to study people's technique from the videos they send me, and how well they've been able to put into practice my guidance. In my coaching packages I combine video assessment with coaching sessions over the phone, and it's been wonderful to discover how rich and valuable this exchange is towards overcoming obstacles and making progress. It's a beautifully flexible way of working with people who can be on the other side of the world! You may have noticed that I've been neglecting HHT newsletters and facebook somewhat this year... 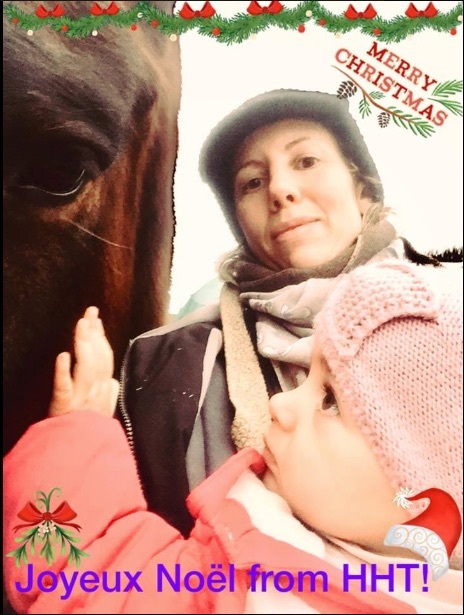 Despite my best intentions, and burning the midnight oil, motherhood and my other horsey commitments have left me with extremely little time for these matters! I have been using up this scarce time working on researching and putting together an in-depth study of the origins of the current downfall of modern dressage. 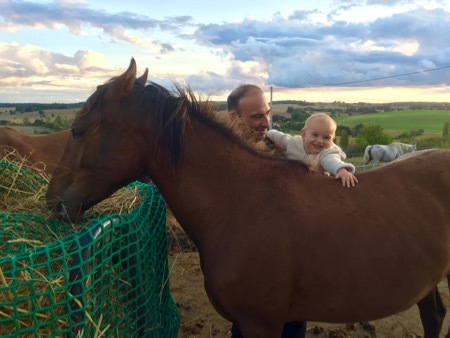 There is just so much deep-rooted convention and tradition stopping well-meaning people from even considering a different way of sitting on the horse that I think a profound explanation is necessary to hopefully open more people up to change. Thanks to some dogged research, I have made fascinating discoveries concerning the history of the seat, and the reasons why dressage riding has, in my opinion, been barking up the wrong tree for the last 2-300 years. So, as long as I find the time(!!) 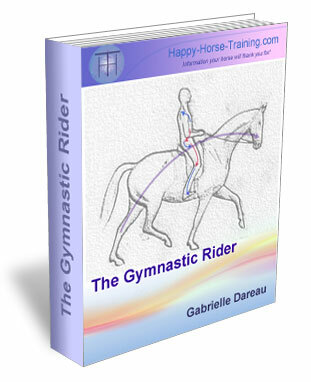 I'm hoping to get this into written and hopefully video format sometime this coming year, along with a new guide for learning HHT's gymnastic riding approach. And have a wonderful New Year full of potential and expansiveness!